Responsible for costing the automotive industry billions of dollars each year, galvanic corrosion can occur when different metal surfaces come into contact with one another. Often characterized by a powdery growth on the surface of different metal parts, this type of corrosion degrades the surface of the metal when metallic ions are exchanged. Since different material combinations react differently, and joining techniques, environmental influences, and surface textures can affect the chemical reactions occurring on metal parts, developing effective corrosion protection requires an understanding of the many factors at play. A clean rivet (left) compared to a rivet affected by galvanic corrosion (right). Engineers at Daimler AG, the manufacturer of Mercedes-Benz, and Helmholtz-Zentrum Geesthacht (HZG), a German institute focused on medical technology, materials, and coastal research, banded together to investigate better corrosion protection methods for automotive rivets and metal sheets that are similar to those present in car paneling. Using COMSOL Multiphysics software, Dr. Daniel Höche of HZG modeled a steel punch rivet joint to gain a better understanding of the underlying electrochemistry, surface conditions, material loss, and long-term behavior of the interacting metals. His model included the rivet, plated with an aluminum-zinc alloy; bonded sheets of aluminum and magnesium; a galvanic couple at the interface between the sheets, represented mathematically; and a 0.1% NaCl electrolyte, which represented the external environment. The geometry of half of a steel rivet in COMSOL Multiphysics (left) and simulation results showing the current density at the rivet’s surface (right). Höche included a corner bur in the rivet’s geometry to simulate a sharp edge. This increased the current flow and the gradients in the electrolyte potential, quickening the electrochemical reaction responsible for the corrosion. He also accounted for nonconstant growth in a magnesium hydroxide deposit, which forms on surfaces during corrosion, by treating the sheet metal and rivet like a set of electrodes. A plot of the localized current density in different areas of the rivet joint. 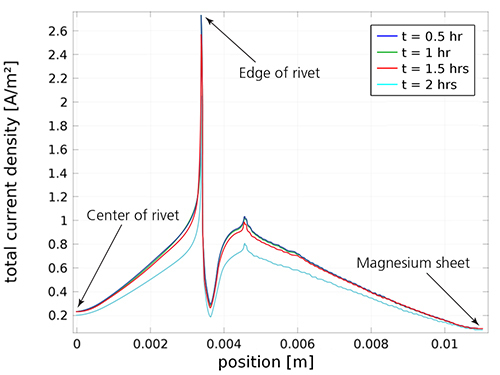 The simulation results show the current density and electric potential when the rivet joint is exposed to the electrolyte, indicating the proportion of the surfaces covered by the magnesium hydroxide growth. Since other automotive components are also in danger of corroding due to environmental conditions, Höche worked with Nils Bösch of Daimler AG to study the delamination of a zinc-plated steel test sheet protected by a cathodic e-coat. Seemingly minor scratches in the coatings or paints on such sheets, which are widely used in car paneling, can give moisture and environmental electrolytes access to the electrically conductive metal underneath. In the delamination process, these coatings become unbonded from the metal sheets they protect, significantly weakening the corrosion protection. A corrosion test on a piece of galvanized steel. “Due to a scratch extending down to the steel surface, you can get a galvanic couple between the zinc and the steel, and the zinc corrodes,” Bösch explained. 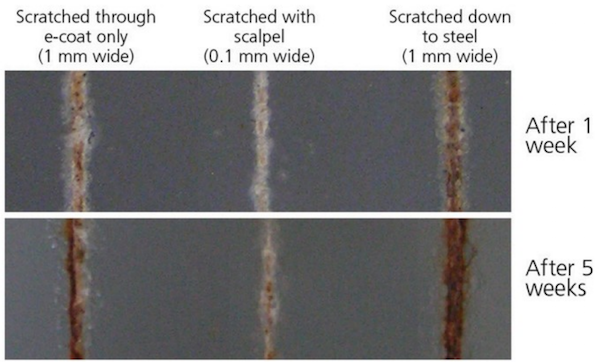 “This results in a crevice that grows continuously between the e-coat and the steel in the horizontal direction, rather than vertically through the layers.” Even though the obvious damage may appear small, because the crevice spreads underneath the e-coat, this type of corrosion is insidious and subtle. The damage may not be immediately noticed and can eventually lead to part failure. A test sheet showing scratches on the e-coat and zinc layers. Bösch and Höche set up a COMSOL Multiphysics model to study the electric potential in the e-coat and the electrolyte, using parametric sweeps to test results for different e-coat properties. 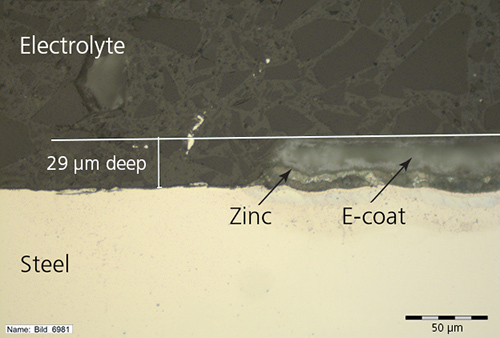 The simulation predicted the horizontal growth of a crevice consuming the zinc in the test sheet, and showed that the width of such scratches is actually more influential than their depth in the metal. Further work will continue to investigate how e-coat flaws influence corrosion protection, using the results from the researchers’ model. Simulation results showing the electric potential in the e-coat and electrolyte. Thanks to their modeling work in COMSOL Multiphysics, Bösch and Höche were able to analyze and predict aspects of the galvanic corrosion process in automotive parts. Their simulation results offered insight into the electrochemical behavior of the different systems and have enabled them to recommend e-coats that exhibit the least decay in car paneling. Their research continues to bring galvanic corrosion control within reach through careful geometric design and knowledge-based processing. Mercedes-Benz is a registered trademark of Daimler AG Corporation. You could learn more by reading this blog post (https://www.comsol.com/blogs/modeling-corrosion-for-automotive-applications/) and the documentation of the models it points to. 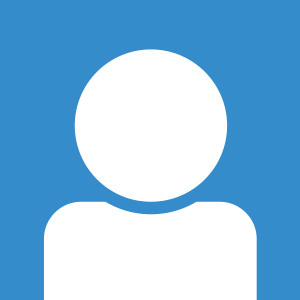 You can also get in touch with out technical support team at support@comsol.com.